Shnoodles is outraged about the 4 categories picked to be during commercials this year! "The affected categories are cinematography, film editing, live-action short and makeup and hairstyling." Posted: Tue Feb 12, 2019 6:56 am Post subject: Steamed Shnoods! That is outrageous! I really am outraged! How can the Academy do this? It just makes me so upset! Arghhhh! On a happier note - Lee and I Shnooded yesterday and I think it went pretty well. Lee went with Roma for her top 3 choices so she obviously has a good feeling about that movie. We will see how it all plays out on February 24th! The other day we sat down with Shnoodles to figure out what the last 13 years of Oscar Shnoods look like. Turns out that Shnoodles has been on an 8 year win-streak (possibly 10 but the scrolls are missing). That is longer than even a MiniNibs mini streak*! Lee is glad to know she once won one. And Duddles is pleased he once tied for first! And many times beat Lee. Will this be the year Shnoodles' streak is laid to rest**? ** Probably not cause Lee picked Black Panther for Best Picture, snarf! Posted: Fri Feb 15, 2019 4:14 pm Post subject: SHNOODLES OMG! The Academy just REVERSED THEIR DECISION and are now going to show all the Oscars live on the air. The power of internet outrage these days! Wow - thanks for your constant vigilance Nibs! The clock is ticking closer and closer to the big show! I still can't believe they are going hostless. Yesterday I had a dream that Paddington hosted the show and fired marmalade sandwiches into the audience. Do you think that could really happen? Anyone want a side McFlurry bet on whether Alex Honnold wins an Oscar?!!! Posted: Sun Feb 24, 2019 7:12 am Post subject: The big day is here! I can't believe the big day is finally here! All the stars are probably busy getting dressed as we type. But now it is time for me to put on the Sensory Deprivator 5000 so I don't get spoiled! I will catch you guys on the flip side! Posted: Mon Feb 25, 2019 5:08 pm Post subject: Mum! Shnoodles is watching the Shnoods as we speak! Well well well. It's been such a big year for bears and bunnies on film! So it seems fitting that it all culminated in STUFFED BUNNIES being FEATURED so prominently at the Academy Awards!!! First can we marvel and the number of bunnies who showed up! Initial counts are coming in at around 50 bunnies! 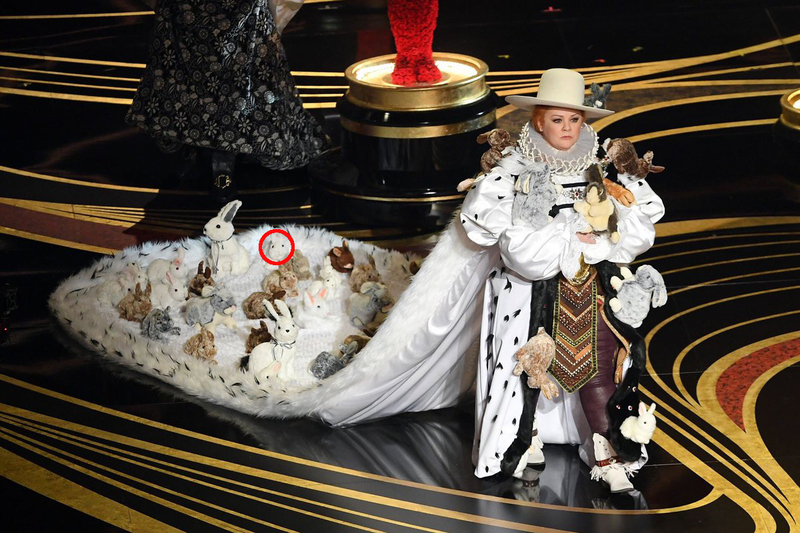 FIFTY BUNNIES WERE ON STAGE AT THE ACADEMY AWARDS!!!!! He also OPENED THE ENVELOPE although we don't yet have pictures of that! This was the highest point for stuffies at the Oscars in the history of the Oscars and I'm so glad we were covering the whole season and ready for it!!!! I'm equally proud of my post in the Bunny Spotting thread that foreshadowed this occurrence! Posted: Tue Feb 26, 2019 6:30 am Post subject: Bunnies! Hugh said if there was a bunny that I like please let him know - so I circled the bunny I like the most! I hope I get that bunny in my gift bag when I go! Posted: Tue Feb 26, 2019 6:45 am Post subject: Bunn-apalooza! Wow this bunny dress really has taken the Schlop site by storm! I hope in 10 years we will get to read an oral history of how the bunny dress was made. That bunny Duddles picked is SO FUNNY LOOKING!!!!! !